Do you ever cook with your husband/significant other? If so, what kind of food do you cook? You probably know from some of my previous blog posts that I’m a foodaholic. I love talking about food and recipes. About two weeks ago, I was so excited about the Royal Wedding. Well, since I’m a romance writer, it was just natural that I’d be interested in the nuptials. It was like a fairy tale. I sighed and swooned as I watched the footage live – I got up at four AM. Then I watched it again later that day. I’d read that the couple was serving a Lemon Elderflower Cake for their reception. I’d never heard of elderflower and since both my husband and I love lemon, I thought it’d be fun to make the same cake here at home. I figured if my husband knew I was making this nice cake to enjoy after the wedding, then, he just might get excited about the Royal Wedding, too. So, the night before the wedding, I found the Lemon Elderflower Cake recipe online and I bought the ingredients. I urged my husband to come into the kitchen with me as I made the cake. He tasted the batter before I poured it into the pans. He loves to taste uncooked cake batter. Once the cake was finished and cooled, I opened the jar of lemon curd that I’d bought from the store. The lemon curd was used as a filling for the cake. I tasted it. It was delicious! He tasted it as well and he loved it! He told me that he was having a great time tasting the Royal Wedding cake. The icing took a long time to make. I let my husband taste the syrup that I made over the stove. After I’d whipped the syrup into the butter he tasted it again. He loved tasting the batter, filling and icing so much that he was anxious for me to cut the cake. However, I told him that we couldn’t cut the cake until after Harry and Meghan were married. So, guess what? He was now anxious for the Royal Wedding! We sampled the delicious cake while Harry and Meghan had their reception. My husband told me he enjoys it when we’re in the kitchen together. We don’t often cook together, but when we do, it’s a fun experience. 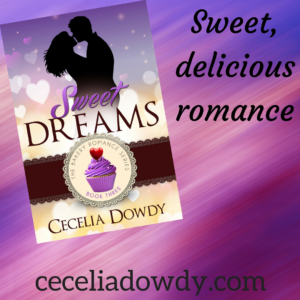 If you’re looking for something different to do with your hubby or boyfriend, then choose a tasty dessert (or main course) and cook it together. Try something new by using a recipe that you’ve never used before. It’s a great way to open the door to a new food experience. 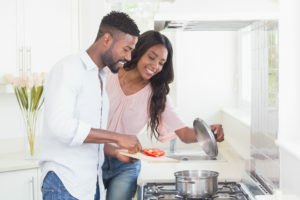 So, do you often cook with your husband/boyfriend? If so, what do you usually cook? I do all of the cooking. It just works out that way. Hi, Mary! I’m not surprised! I’m sure it works out that way for a lot of folks. Do you enjoy cooking? Hi Cecelia! As a foodie with a sweet tooth, I enjoy reading your books and blogs. I love cakes and German Tortes, so I enjoyed reading about your experience making the Lemon Elderflower Cake. I had never heard of Elderflowers, but I love lemon cake and frosting. I enjoyed the Royal Wedding and it has been entertaining that Hallmark has been showing several of Meghan Markle’s movies the last few weeks. I find cooking relaxing and therefore do all the cooking for our family. My boys and grandchildren prefer it that way. We enjoy a variety of cuisines depending on our mood and how much time I have to prepare a meal: American, German, Italian, French, Asian and Mexican. One year just before retirement, hubby and I attended cooking classes together. It was fun to watch and learn cooking techniques from local chefs and partake of a three course meal by the end of the meal: appetizer, main course, and dessert. Now in retirement we go on road trips and check out new restaurants and different cuisines. Best wishes and Happy Writing. Yes, my kitchen can get quite messy when I cook! Sometimes I’m lazy! I leave that kitchen in a mess until the following day! Depends on how tired I am! Blessings to you, too! This is an awesome post! Hubs and I cannot cool together AT ALL. I am Italian North Jersey born and bread, he is a Georgia boy…so he cannot watch me cook, as I do nothing like his momma did, lol! He does, however, LOVE to eat what I put in front of him, hahaha!! Great to hear that he eats everything you put in front of him! My husband seldom complains about my meals! What a cool story. Thanks for sharing. Right after we got married (and started grad school), my husband and I did everything together in the kitchen (cooking, cleaning) but mostly meals, since we were on a tight budget (no money to spare on sugar, flower..). At some point though my aunt gave us tons of bread flower and we dived into trying to make fun time out of it (thankfully he was more than happy to knead the dough). It was really a great time we had together. Last week he actually told me he misses our time together in the kitchen, but after grad school, life crept in.. and now with a baby on board, we barely have time to sit for meals, even less to make them. Elderberry bushes grow wild around here, and I have several times made elderberry juice and jelly. It is very high in Vitamin C, and my mom used to keep the juice on hand as a daily elixir to keep healthy. Hubby and I usually cook together only when we’re camping. I do most of the prepping, and he does the cooking on the grill, camp stove, or over the fire. At home, our kitchen is fairly small, like a well-designed cockpit. My daughter, daughter-in-law, and I can cook together in there – you just have to keep an eye and do “the dance” to let others by! Hubby’s not a fan – he likes his space – so that might be one reason he enjoys cooking outside. There’s plenty of room! Oh, I loved hearing about the wild elderberry bushes! I didn’t realize the juice is high in vitamin C! I noticed the liqueur had a citrus taste to it. I’ve noticed a number of men enjoy grilling while women are more apt to enjoy cooking in the kitchen! We’ve never done that. In fact, our kitchen used to be so separate from our family room that I always felt like I was in exile from my family when I cooked. We remodeled last year and actually moved our kitchen so that now we have a great room combining our kitchen and family room. So we’re in the same room now, but I don’t think my husband is adventurous as yours. He likes to watch TV while I cook. But we do talk and visit while I cook now. Hi, Shannon! It’s great that you guys talk while you cook! LOL, I love your plan to get her husband interested in the royal wedding, Cecelia! Elderberry bushes grow wild here in England. The flowers are big heads of tiny creamy flowers. I’d planned to pick some to make elderflower cordial, but missed doing it because of a deadline. Not only is it delicious, it’s medicinal too – an old remedy for reducing fevers. Oh well, not picking the flowers means I’ll have more berries on the bushes in the fall to make elderberry syrup! Hi, Autumn! I didn’t realize that elderberries had medicinal purposes – fever reducer? Cool! Elderberry syrup sounds delicious!